← About Fukushima: government ‘authorities’ are not telling the truth! The American Dental Association recommends poison for everyone! WHEN YOU REVIEW THE ‘REAL SCIENCE’ REGARDING THE POISONS: FLUORIDE, MERCURY, AND ASPARTAME . . . YOU WILL BE SHOCKED! The American Dental Association (ADA) is not a health advocacy group, in fact it is just the opposite. They are actively (and knowingly) engaged in the promotion of toxic substances and harmful behaviors to the general public. The ADA is fully aware of these facts. Over many years numerous dentists and toxicologists have brought this information to their attention. In fact a 2003 report from the Swedish government classified amalgam as “unsuitable for dental restorations”. In addition many injured patients have tried to sue the ADA for promoting these toxic substances. Unfortunately, due to legal loopholes and a corrupt legal system the ADA has managed keep their organization out of the courtroom completely and avoid being held responsible for their actions. Their latest ploy to poison the public however is beyond despicable. Several years ago my dentist cautioned me about gum chewing. He told me it was the worst thing I could do to my dental work. Imagine my surprise when I read what is now on almost all chewing gum: ” . . . the physical action of chewing sugar-free gum for 20 minutes after eating, stimulates saliva flow, which helps to prevent cavities by reducing plaque acids and strengthening teeth”. 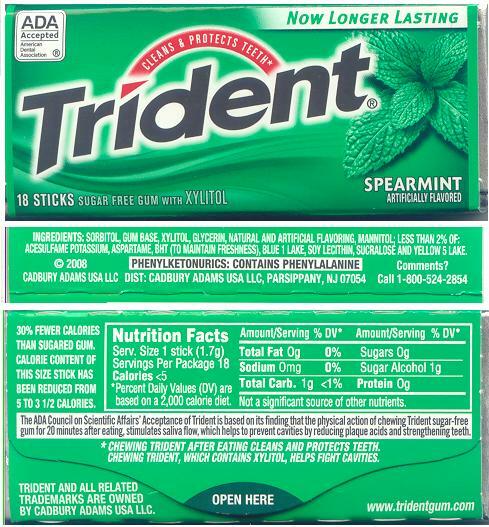 And if you read the packages of regular gum, you will discover they are now putting Aspartame in all gum – not just “Sugar Free”. They have also added new brands with packaging colorfully designed to attract more children and unsuspecting adults. After watching the Smoking Teeth video, you can easily comprehend what effect the ADA’s recommendation will have. If folks adhered to the ADA recommendation they would be actively releasing mercury from their fillings into their system for seven hours each week – above and beyond the act of eating. Add to that the toxic and addictive nature of Aspartame (see Sweet Poison) and the picture becomes even more grim. The fact the ADA denies all of the real science presented to them has everything to do with their desire to avoid liability for the harm they have already caused. The fact the FDA has not put a stop to these poisonous practices is just more proof that the Food and Drug Administration DOES NOT FUNCTION for the benefit of the public!!! However, there is a new development (announced just 5 days ago) in the ‘mercury-free dentistry’ movement. The US ‘government’ has agreed to a ‘phase out of amalgam’. http://www.iaomt.org/news/archive.asp?intReleaseID=366 Perhaps the fact that the ‘government’ is attempting to move us all to mercury filled light bulbs (compact fluorescents) has impacted this decision. Those mining and selling mercury have a new mass market, so they can now let go of the old one. But, in reality there is no exposure to mercury that is safe (and that includes Thimerosal in vaccines). Mercury is toxic to the human body . . . and most other living things. This entry was posted in corporation, Science and tagged American Dental Association, aspartame, fluoride, gum chewing, mercury. Bookmark the permalink. To answer the last question, I think all the dentists and doctors are blinded by the money they make. If they believe mercury is bad, then it probably isn’t quite so enjoyable to spend that money, considering all the pain and suffering they are causing. It is much easier to blow it off like the ignorant author of the first comment who says he has been a dentist for 30 years. As if practicing dentistry has somehow made him an authority on health. Wow. Just goes to show the older you get, the more your neurons turn to cement. He has undoubtedly caused much disease and suffering because of his ignorance and willingness to sell what is obviously a defective product. How can any reasonable person think mercury is safe in the mouth? One dentist wrote a paper about it in 1883 – he was able to recognize it as a bad idea way back then. The main confusion with mercury is that some people get really sick and some people don’t. It’s because the elemental form of mercury used in amalgams in converted by certain yeast and bacteria in the body into the vicious, very toxic methyl mercury form. It is this form that is about a hundred times more toxic than the elemental form and does tremendous damage to the body. The reason some of these heavy metals are so bad, like mercury, is because they bind to body tissues – get lodged in receptors all over and mess with enzyme systems. Chelation is the only way to get them out. And that can get extremely complicated and expensive. As an electrochemist it has always boggled my mind how Dentists can go all through dental school and thing that putting mercury in patient’s mouths is a good idea. Dentists are even drilling into that mercury when they have to replace fillings. That vaporizes and flings mercury all over the place. To make matters worse the newer mercury fillings they’ve used for the past 15 years or so have a ratio of metals that forms a mini battery which makes even more mercury leak out of the filling. It’s the schools that just shock me. What on Earth are they teaching these people? Medical school and Dental school…seriously, why are dentists and doctors so poorly educated?? They don’t understand basic science. Thats kinda ridiculous that american dentist association is recommending poisonous flouride to patients which will harm them a lot.Though somehow they managed to keep themselves out of court and law government should take some serious steps against them. Dentists have to wake up and realize that their “profession” has been taken over by the American Dental Association. Like the American Medical Association the ADA does NOT represent the best interests of the patients. At some point in the future, both dentists and physicians will wake up and either take back these organizations that so ruthlessly control them OR establish new ones that represent REAL science not politicized corporate science. Another fallacy both dentists and physicians have to realize is that government agencies are controlled from the top by the corporations they are meant to regulate. This is how Aspartame got approved. This is a really strong accusation on your part. If you are people who have done research on dental care and the chemicals involved with it, I might just believe you. But no. You are an anti-corruption society. You see everything as corrupt and not worth trying. But did you even spend most of your time doing research on this? Did you even consult ADA and see what they do and what they still need to do to improve the world of dental care? And yes, my cousin is a dentist. Surely she would not tell me to chew a sugar-free gum if it harms me, right? She’s one of the closest I have so she wouldn’t really do something “harmful” to me. So please do more research. I have done the research or I wouldn’t have posted this article. There is no legitimate excuse for the ADA not doing this research prior to recommending people chew Aspartame laden gum. They got paid for their endorsement and that is all that matters to them. As long as your cousin continues to harbor fantasies about the ADA, her recommendations are to be ignored. Russell Blaylock, MD, neurosurgeon, thoroughly researched Aspartame and has done his best to share his results with the public. It is unfortunate that so many of the ‘institutions’ we were taught to respect are not trustworthy. Government should establish constraints to keep corporations (like Big Pharma) from harming the population. Unfortunately the corporations now set constraints on the government; as was the case with the ‘approval’ of Aspartame. If you haven’t yet watched the documentary “The Corporation”, you still don’t get ‘perception management’, which Burson-Marstellar specializes in. There is a link to “The Corporation” in the right column of this web page. I spoke directly to several of the dentists who founded the International Association for Oral Medicine and Toxicology. They helped to educate me. I suggest you contact them directly. When my husband asked his dentist about fluoride, the dentist contacted the ADA. The ADA faxed info to this dentist, who handed this material to my husband. The first page in the faxed packet instructed the dentist NOT to hand the materials to patients but to use the ‘talking points’ they had sent him. They did not want to be liable for providing materials directly to patients. They are information gatekeepers passing themselves off as advocates for the dental profession. They can use their clout to have the license pulled from dentists that don’t toe-the-line. They have done it many times. It is pure extortion. I’m sure you are aware that you were not trained in toxicology. Did you know that the ADA has patent’s on certain amalgam filling products? Did you know that the dentist’s that use amalgam filling materials are subjected to years of inhaling mercury? Do you know what that has done to your mental acuity? Did you ever wonder why dentists have the highest suicide rate of medical practitioners? Please contact the IAOMT organization and get more info. They will be able to help you find ways to kelate the mercury out of your system. They can also help you find the information you need to be able to safely remove amalgam fillings without further exposing the patient and yourself. The IAOMT does not practice extortion. Like the AMA, the ADA was set up by unscrupulous individuals who wished to control and profit from your profession. If you try to expose this racketeering organization by yourself, they will do their best to destroy your career. There are many dentists who have figured this out and are now practicing safe dentistry. However, because the ADA is so powerful, they do it with discretion. Please research the links I provided and educate yourself. This is as much about protecting your health as it is about protecting your patient’s health. hal you should take the time to learn basic science. I would have thought you took a basic chemistry course in college but perhaps not, or maybe you didn’t pay attention or do very well. Get a chemistry book and learn the basics. Read some medical studies concerning mercury. Educate yourself, don’t just stay ignorant and keep poisoning yourself and others.